Fuel-starved endurance athletes are notorious convenience eaters, scarfing pre-packaged products and expensive prepared foods that offer a quick fix for their ravenous appetites. But these food products and supplements leave athletes under-nourished, delaying recovery and preventing their highest performance. For endurance athletes, there is no substitute for real food. The Athlete's Plate: Real Food for High Performance debunks the myth that busy athletes lack the time to fuel with real food. Professional chef and endurance athlete Adam Kelinson guides athletes from grocery store to kitchen, offering time-saving shopping and cooking strategies that make preparing delicious, nutritious meals a pleasure. The Athlete's Plate is now available in bookstores, endurance sports shops, and online. Kelinson demonstrates how buying local, seasonal foods will save time and money. He explains how organic whole foods provide more nutrients than conventionally grown food and how a minimalist approach to cooking is more convenient and nutritious than laborious gourmet recipes. The Athlete's Plate provides 85 delicious, quick-prep recipes to fuel the active lifestyle. Kelinson's worry-free dishes include smoothies and juices; power snacks; appetizing soups, salads and dressings; carb-filled pastas, polenta, and noodle bowls; lean protein dishes featuring seafoods, poultry, pork, and savory vegetarian preparations; and satisfying desserts. 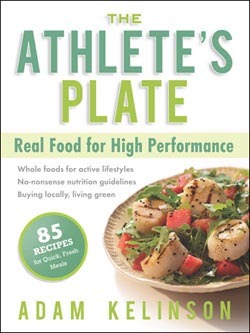 The Athlete's Plate reflects Kelinson's years of experience as a professional chef, endurance athlete, and student of the relationship between nutrition and the environment. The book offers a no-nonsense way to balanced nutrition, incorporating all the nutrients athletes need to fuel and recover for training and racing. Athletes will learn how to make nutrition an enjoyable part of their lifetyle instead of a limiter on their performance. Paperback with 2-color interior and two color photosections. Adam Kelinson is a professional chef and the founder of Organic Performance, a nutrition consulting company based in New York. Kelinson is an Ironman triathlete and has written on diet and nutrition for TrailRunner, Inside Triathlon, xtri.com, and dietwatch.com. He has cooked for elite athletes, corporate executives, and celebrities like Prince, Hillary Swank, and Mariska Hargitay. For more information, please visit organicperformance.com. VeloPress is an endurance sports and fitness publisher with training and history books on cycling, triathlon, running, and diet and nutrition. For more information, please visit velopress.com.